Hi friends! It's Sunday and that means time for a new challenge at The Paper Players! 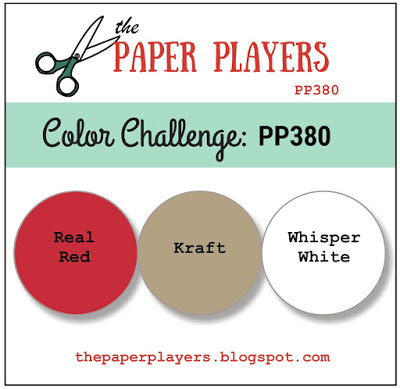 This week the wonderful and talented Laurie is our hostess with a great color challenge. My son tucked this cute paw print stamp into my Christmas stocking last Christmas, and I thought it would be fun to use it to make a Valentine for him. I tried to keep the card masculine, or at least as masculine as you can make a Valentine. The paw print is heat embossed with black embossing powder. It is super shiny IRL, but I forgot to take a photo of the shine and now this card is already on its way to him! Sandy I love the clean, sharp lines to your design this week - I'm sure your son will love this card, especially since you are putting your Christmas present to good use! I like the layout of your card and the papers you've picked work so well together. Very cute stamp - I'm going to have to tell my kids more strongly that stamp gifts are good, I think! Oh, such a great Valentine!!! I think that is a great gift too. Great masculine card. But it is so sweet that you son gave you the paw print! The sentiment is perfect! Awe..so sweet. LOVE it Sandy!He will really like it. Aw, what a thoughtful gift your son gave you! 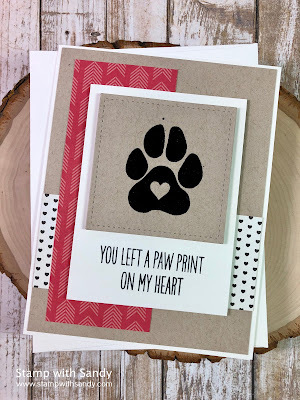 And what a sweet little card you created...love that little paw print! Super cute, Sandy! Love the way the shiny black pops on the kraft and coordinates with the sentiment and the background dsp. Such a sweet gift from your son too--he will love seeing used on this card!